Posted on March 23, 2019 March 23, 2019 Categories Civic EngagementTags bikeway, greenway, history, stonehamLeave a comment on Can I do a tour without mentioning wolf attacks or naked sailors? This week was “Bike to Work Week”. My employer is big into Bike To Work week, and strongly encourages people to participate. It’s also pretty mellow on the “show up exactly at 9 and leave exactly at 5” scale (as long as your work gets done). So with the near-completion of the Stoneham Greenway, all the way through to Winchester Center, I reckoned just maybe it was time to give it a try. I’m pretty scared of biking in traffic. My sister had an extremely serious biking injury when I was in my early teens. Biking in traffic like a grownup seems terrifying. So I posted to an internal group that I was interested in participating (going from my house to Alewife and taking the T in), but asking for good route advice. I got excellent route advice, a t-shirt with a weird Illuminati-biking theme, the loan of front and back headlights, and a colleague who SHOWED UP AT MY HOUSE AT 8:15 to ride in with me and make sure I felt safe. The mind boggles that people could be so awesome, but it turns out that sometimes they are. It took a surprising amount of mental energy. It also took about 2 hours each way, so that’s unlikely to become a regular thing. I thought a lot about what I was going to do, how I was going to do it, and what I’d do if it didn’t work. It was a really novel experience, and I was interested to see how much my mind was engaged and excited by the novelty of it. I was also surprised and pleased that I wasn’t all that physically wiped out by it (except for mebbe that last hill on the way home). I’ve been in better shape lately – we’ve been running a loop with the bikeway as well which is close to 4 miles and I set a personal record best time & personal record longest run last week. There was this moment, as I spun through brand-new asphalt on the not-quite-yet-finished bikeway where I really really enjoyed the fact that it exists at all. The community came together and made this thing happen, which was not easy. My first post about it was five years ago. Since then there have been Town Hall Meetings, letters to the editor, phone banking, cleanup days and patient and concerted effort to make it happen. It’s astonishing to think that after so long, the efforts of the good-hearted people of Stoneham are bearing fruit, but here they are! Speaking of bearing fruit, I’ve been more than a little obsessed with my plums this year. The point at which you’re putting a space heater out for a fruit tree, you have crossed some important line. However, I’m happy to say that they’ve made it the furthest this year in the history of this benighted plum. There are hundreds of tiny little fruits. Most are the size of a lentil, but there are one or two that are the size of really small olives. I’m excited to learn what disaster can kill fruit at this stage! I’ll let you know. I’ve been getting strong pressure from maternal sources to post an update in the attic situation. Here’s the album where you can watch the whole thing progress. We have the electric & plumbing in, as well as a lot of the framing. Almost all the demo is completed (or was, until we increased scope like the home owners we are). The inspection has been done. There’s a bit of waiting for the next step – we need to put in the new windows, but they’re on order and won’t be ready until early June. We also need to get the HVAC in and all hooked up. We opted to go for a bigger unit so we can drop some cool air in summer down to the 2nd floor and actually get it to be a comfortable temperature – sandwiched between two zones. We also had to put in new hard-wired smoke detectors for the whole house to bring it up to code, and bring in a new electric bank. Once we have HVAC & windows in, we’ll do closed cell insulation from the bottom of the walls to the tip top of the roof. We’ll need to vacate the house then for a day. But that’ll be the biggest tipping point – then we can start doing finish type work like, you know, walls & stuff. I reckon the project will be done by early August, if I’m lucky. I got to go to Fenway on Thursday night for the makeup game from Patriot’s day. It was so perfect. The weather was ideal. The game was excellent (and we won). It’s an interesting moment when you learn that your child is really good company. We had good conversations, we were game-watching-compatible. On the walk back to where we parked, he didn’t like how someone had bumped up against me, and then protectively took the spot between me and other people. How quickly we go from protecting them to them feeling protective of us. He’s still not bigger than me, but that will not last long. In the same vein, every year for Mother’s Day we go to the Arnold Arboretum for the Lilac Festival. And every year for many the boys have climbed these ponderous birch trees with tempting limbs and I’ve taken their pictures there. This year, we arrived to find a denuded slope. I never thought that the grand trees my boys climbed on would not outlast our Mother’s Day tradition. I will admit tears welled in my eyes. I’m grieved for the magnificent trees that were lost (although I’m sure the arborists did everything in their power to save them). But it was this shocking moment to discover that we are all now old enough for things that were traditions to come to final endings. It’s astonishing enough to have sufficient tenure to parenthood to have traditions in the first place. I feel very unready to have traditions end. Every year for Mothers Day I write my mother a letter about how things have been in the past year. Last year I wrote a letter that talked about how overwhelmed I was, especially with huge projects like the pastor search and kicking off the attic project. I added a few things to my tally during the course of the year, the largest of which was probably getting a new job. But slowly slowly slowly, since about January, I’ve been unburying myself from the accumulation of things that needed to be done, and shortening that infinite to do list. Clearing out the attic in preparation for our project was a huge one that I suspect added a lot to my anxiety. Things have been getting crossed off. I’m starting to arrive at a point where I almost feel like I can actually rest without guilt, sometimes. Of course, there’s always more to-do list to go, and I haven’t fulfilled every promise I made for “after we hired a pastor”. But I’m closer, and that’s really reassuring. On Tuesday, April 7th 2015, Stoneham Voters will head to the ballots to select our town’s leaders. If my engagement with the Bikeway has shown anything, it’s shown how critical great town leadership is to improve the experience of living here. One of the great challenges I’ve realized lately is how hard it is to get information and form an informed opinion on local politics. There’s very little easily available information. If you don’t know where to go for what information there is, the problem is worse. This means that new folks to town, or people who aren’t amazingly well connected, either don’t vote, or don’t cast a knowledgeable vote on the election that may have the most impact on how they live. Will the town have a bikeway, or not? Will we bring more people to our downtown, or not? Do we build affordable housing, or do we lose some of our autonomy and have state oversight to guarantee we have affordable housing? How do we balance our tax base, infrastructure needs, education spending and other services? It’s local officials who decide those key issues. I had tried to figure out how I’m voting in this upcoming election. The Selectman’s race is particularly a difficult one for me. I’ve had some personal conversations with some folks in Stoneham about who they’re voting for, and why. I should mention that my thoughts below are my private opinion, and not as well informed as I’d like it to be. I’m certainly open to corrections, amendments or additional thoughts from you – or the candidates – about the elements I’m thinking about. I really wish there were an independent, clear, easily accessible voter’s guide for Stoneham voters. As far as I know, that doesn’t exist. This isn’t that – this is my opinion. The selectman’s race was one I thought a lot about. It’s a crappy job. It pays something like $3000 a year, requires considerable time and effort, and brings with it a ton of aggravation and abuse. One has to think through the motivations for why you’d do it. Idealism? Service? Love of power? Love of attention? Desire to change the town? Desire to help your friends? Family habit? Greater political ambitions? 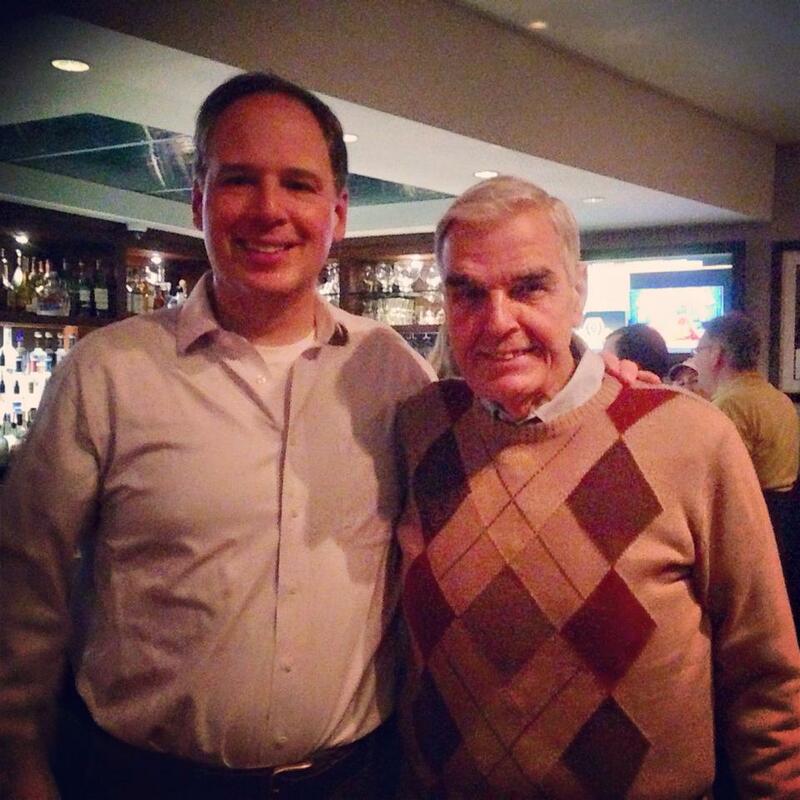 Tom is the one candidate for Selectman I feel I can wholeheartedly endorse. Tom worked very hard on the Bikeway (before we brought 800 people to a town meeting to forcefully exert the will of the people). He’s energetic and enthusiastic about making the town a more awesome place to live. Tom and Anne Marie O’Neill represent the forward-thinking contingent of the selectmen (you know – the ones who DIDN’T vote against the Bikeway in the October meeting.) I feel like his motivations have to do with an energetic enthusiasm for the town. The second selectman vote has been hard hard hard for me to decide. Frankly, I don’t like any of my option. There was a second vote (Devon Manchester) whom I was excited about. I heard (admitted hearsay!) that he withdrew because the State Republican Party told him if he opposed Caroline Colarusso they’d never support him again. I resent having my choices limited for me like that. I quickly ruled out Bob Sweeney as a choice. He’s definitely been one of the folks who has never taken a public stand against the bikeway, but quietly worked to make sure it didn’t happen. (Someone had to be working hard to make sure it didn’t happen!) He has been dismissive of other voices in the community, and has a tendency not to show up for his duties. He didn’t even show up for the televised Candidate Forum. No, thank you. So now I’m down to two, and I have a number of pros and cons for each. – Given the number of elections, it’s clear that she sees selectwoman as a step on a larger political path. On one hand, that means she’ll be posturing to make herself look good for the next run. On the other hand, it gives her a motivation to show up and do work. – She’s Bob Sweeney’s daughter, and if they’re both elected we’ll need to get a nepotism allowance for her to serve [ed. 3/26 see her note in the comment regarding this]. I don’t actually think the town needs MORE nepotism. – She’s also a salaried town employee. That seems like a conflict of interests that would require special handling. – When I asked what she’d done for the bikeway, she said that she was a “private citizen” and therefore hadn’t done anything. I am also a private citizen and I did do something, so I’m not super impressed with that answer. You can see my question and her response on her Facebook page. From what I’ve seen, Larry has done a good job in a very thankless job. His opponent has a platform of making passive aggressive jabs at Larry, and then not showing up for voter information forums. Not impressive. So I’m ready to vote for Larry! So that’s what I’m thinking. I’d love your feedback. Who are you thinking of? Why? What did I get wrong? What resources did I miss that a Stonehamite should know about? How are you making your decision? Who do you recommend for the races I don’t have an opinion on? Back in 1988, a few folks had an idea about turning an old rail line in Stoneham into a trail. It was a cutting edge idea, at the time – the rails to trails projects were just kicking off. But the land was publicly owned, and it seemed like a good idea. Twenty-seven years later, the plan has final cleared (almost) all the hurdles required to break ground. My own part in this saga was trivial from that big picture perspective, but it was extremely illuminating for me. Looking from the outside in, it can be awfully hard to get a hook into local politics. For example, googling my selectmen before a vote revealed… pretty much nothing (fun fact – my blog posts are like time 20 hits on nearly all of them). You can find some general information on what they do for a living. One or two of them have campaign pages, which reveal, well, nothing. Without a hook into the community, it’s hard to tell the obstructionists from the development-happy, the cooperators from the blockers, the sensible from the selfish. It’s almost impossible to educate yourself to vote responsibly when neither you nor anyone you know has any insight into these candidates. So in this complex community, I finally had a touchpoint. Using information available to me, I could see that the Greenway was good. This provided me the entryway into understanding more about the town. My involvement started out very lightly. In 2011 I walked the Greenway route. In May of 2013 I wrote about the project. In a sign of my outsiderness, I tried to reach out to the Selectmen using the publicly available contact information (which was rather unsuccessful). Then this fall, at the request of a friend, I went to the Town Hall meeting where the vote was both delayed and denied. I was shocked into action. The excuses for failure were SO LAME. And they looked very much like they were going to successfully kill the project. I spoke at the meeting, and came to the attention of the advocates. Coming back from that meeting, I wrote a letter to the local newspapers. I reached out to the supporters, and helped collect signatures for a special town hall meeting. I engaged in the ad hoc group that pushed to get out the vote over a one month period. I walked door to door with my kids. I cold called 200 likely voters (a more pleasant experience than usual, based on the fact that 99.8% of the town thought the Greenway was a great idea). I called for the vote in the special Town Hall meeting, packed to the gills with hundreds of usually unheard residents who had answered our calls to support the project. My portion of the effort was definitely at the eleventh hour and much less than that of others, but when the time came for drinks afterwards, I got the invite. I sat at a table of people who had poured years, tens of thousands of dollars and their hearts and souls into making the town a better plan to live, with no ulterior motivation. There was elation. There was exhaustion. There was a vague sense of unease that the opposition might find one more thing we hadn’t known about or thought about to block the project. I looked at those people, still struggling to put faces and names together, and settled into my place in the community. Many things have come from this effort. The largest, of course, is that we now have a Greenway (assuming nothing bad happens from here on out). We have invited many residents of Stoneham to their first ever Town Hall meeting – hopefully some number of them become more engaged in guiding our community. I hope that the older entrenched interests in the town have realized that there are many more people in Stoneham than the handful of hundred who have historically done so much for the community, and that our planning needs to take both new and old residents into consideration. And I – I hope that I and my neighbors become more engaged in the town. Finally, enduringly, I have made some new friends in this adventure, who may be my friends in this great town for years to come. What about you? Do you understand how your town ticks? Are you a voter? How do you figure out how to vote on local issues? How does a stranger come to become a local in your community? Posted on October 30, 2014 Categories Children, Daily livingTags bikeway, greenway, rec park, stoneham cheer, stoneham football, stoneham tvLeave a comment on Update on the Stoneham Greenway! Friends, I had the opportunity to attend a Town Meeting last night. This is my letter to the editor about the topic. If you don’t live in Stoneham, feel free to ignore. 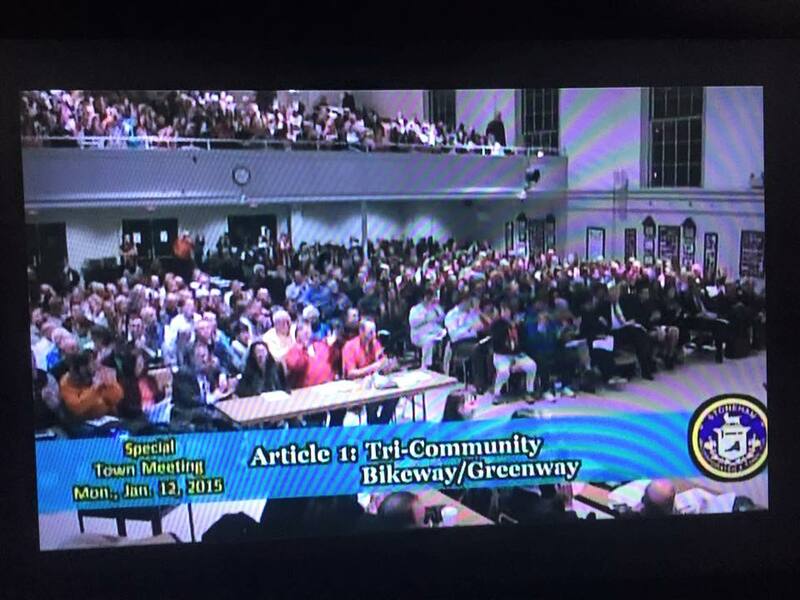 If you do live here, please – in addition to reading my note – contact your Selectmen to let them know you expect their enthusiastic support of the bikeway! I’m a mother to two young boys: six and nine. In just a few years, my oldest son will get to go to the great new Middle School we’ve built. In order to get there, though, he’s going to have to cross Montvale and Main Streets. Right now those crossings make me nervous. When the Bikeway becomes a reality, my kids – along with many of others in town – will have a much safer way to walk or bike to school. The bikeway will give us a safe place to teach our kids to ride, connect our community and bring biking enthusiasts to spend time and money in Stoneham! Recently I attended a session on the future of Main Street. One of the points that was made was that Stoneham needs to attract young families to stay vibrant. Our population is aging. To support them at the level they deserve, we need to promote growth and vibrancy in this town. Our Main Street lacks the foot traffic it needs to attract new companies like Starbucks, and to support local businesses like Angelo’s or Cleveland Fence. In an amazing coincidence, Stoneham has a nearly finished plan for a Greenway (multi-use trail and park) with $5.5 million dollars of outside funding to make more foot traffic happen. Construction could begin as early as next year. By the time my 3rd grader is headed to Middle School, he could take the Greenway! At the Town Meeting last night, there was a lot of impassioned discussion, and the Board of Selectmen was not authorized to begin negotiations on the temporary construction space needed build the Greenway. (Funny note: John DePinto and Robert Sweeney both voted against giving themselves the authority to help move the Greenway forward!) I worry that MassDOT, who’s giving us the $5.5 million, may think Stoneham doesn’t want or support the investment in public space and resources. They might pass us over in favor of another town that speaks with a more unanimous voice about wanting that investment. The no voters on article 10 last night said they needed more time and more clarity, but we don’t have an infinite amount of time to make this happen before we might need to look at funding this ourselves. Delaying the support of this project could risk our funding. Not a single person at the meeting last night said they DON’T want the Greenway for Stoneham, but I’m afraid that might be the unintended outcome of delay. So I’m asking all of you: local businesses, Selectmen, football parents, voters, leaders and visionaries in Stoneham. Ask your questions. Get your answers. Find your clarity. Do it fast, and once you understand, throw your whole-hearted, active and vocal support behind this phenomenal opportunity to make Stoneham an amazing place to live. Posted on October 28, 2014 October 30, 2014 Categories HealthTags bikepath, bikeway, David ragucci, Frank Vallarelli, john f depinto, massDOT, robert w. sweeney, selectmen, stoneham, Thomas Boussy12 Comments on Get the Greenway Going! For those of you who do not leave in Eastern Massachusetts, you now have my permission to skip this post. Those of you who live in the greater Boston area – not so fast. This amazing tunnel runs under I93 and connects the communities. I live in Stoneham – a small town that happens to be 11 miles from the soaring skyline of Boston. My community was hit hard by both September 11th and the Marathon bombings, but it’s generally a quiet place. I really enjoy living here. I have phenomenal neighbors. The schools are (so far) excellent. I can walk to just about anything worth walking to, including a used book store and a theater. (In the sadly lacking department, I CANNOT walk to good coffee. Woe!) Just yesterday, we had the annual Stoneham Town Day where the entire town turned out wearing their Stoneham gear and bounced in bouncy houses, painted faces, raised awareness and hung out. Almost all the route has been planned, with official plans accepted by Mass DOT. The bikeway has obtained legal rights to the land with a 99 year lease from the MTA. All previous leasees’ leases have expired and the land is now legally free and clear for the public good of Stoneham. With one exception (we’ll get to that in a moment), every business who had previously been using the public land has created and executed a plan to get the bikeway through the route. Special thanks to companies like Cleveland Fence who worked hard and negotiated in good faith to make it happen. Most critically, the Bikeway has obtained federal funding for construction for 2014. Seriously, people, they can break ground before my kid hits third grade. Of course, there’s one catch. One person has decided their driveway is more important than an entire community’s needs, and despite many good faith efforts by the Greenway committee, this person is refusing to move the 500 trucks worth of fill they put ON PUBLIC LAND and is now trespassing. They have been served with an eviction notice. I have to admit that it makes me really angry to think of one person ignoring both legal and moral obligations, who is willing to destroy a project that will serve the people of the community their business is in. So… what can we do? First, there is a meeting of the Stoneham Board of Selectman on Tuesday, September 10th 2013. I intend to be there – with my children – to let the Selectmen of Stoneham know how important their leadership on this issue is to me, and to my community. This is not a project that needs you to open your wallet (see also: federal funding!). This is a project that needs you to use your voice to make sure that the community comes together to push it across the finish line. You can find contact information for the Stoneham Board of Selectman here: http://www.stoneham-ma.gov/board-of-selectmen – let them know what you think! You can also find WAY MORE details about the greenway here, including the published plans, a map of the final route, the history of the project and community, and tons of pictures. For your voting reference, I have also sent an email to every single one of the Selectmen, letting them know about my feelings on the topic. I’m including the replies below! I sent them all emails on 9/8/13 at 7:45 pm. Thank you for making your voice heard. The bike path is important not only because it will be a good asset for Stoneham, but also because bringing the citizens of Stoneham out to demand action from their leaders represents a major policy shift. We deserve better and we have been over looked for too long. Thank you for getting involved and thank you for encouraging your friends to speak out as well. If you are able to come to Tuesday’s meeting please introduce yourself. One of the most rewarding aspects of this role has been to meet my neighbors.